There has also been speculation that the flag dates to as late as the American Centennial in 1876, but regardless of the age of the original flag, its pattern and design has become iconic in American culture. The American Bicentennial of 1976 saw the Bennington Flag emerge as a tremendously popular choice for Americans wanting to display a patriotic representation of an early American flag. This example in the Rare Flags collection is extremely special and scarce. Whereas most examples from the American Bicentennial were mass produced and manufactured, this flag is homemade and entirely hand sewn. At nearly 8 feet long, it is a masterpiece of workmanship. The stars of the flag, which are large and bold on the canton, are single-appliqué, meaning that the maker cut the shape of the stars through the canton and then used a single piece of white fabric for the star itself. This method of creating the stars on our flags was prevalent in the early 19th century, but by the 20th century it had become a lost art. To see this construction on a flag made toward the end of the 20th century is remarkable. The sleeve hoist shows evidence that the flag was flown, though its excellent condition indicates that it was only used briefly, perhaps just at the time of the Bicentennial Celebration. The stylized "76", which is also of single-appliqué workmanship, has a charming, folky 1970's era flare to its font. The seamstress used blue thread when stitching the stars and 76 on the canton to hide the stitches against the blue background. True to the style of the original Bennington Flag, the stars of the flag are seven-pointed, the flag starts and ends on white stripes rather than red, the canton extends through nine vertical stripes, and sits on a red stripe. The flag has a companion, a beautiful Continental Colors, IAS-00332, which was made at the same time and likely by the same hand. Of the thousands of late 20th century and 21st century examples of the Bennington flag which are continually offered for sale in the marketplace, this is the only pieced-and-sewn homemade example of the type that I've ever encountered. 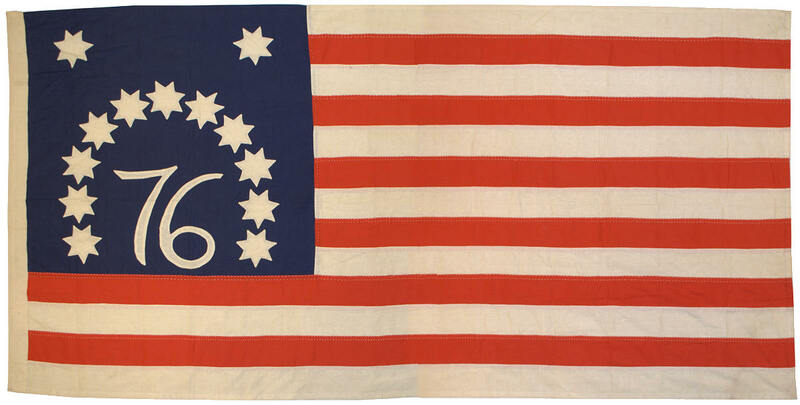 It is a modern masterpiece of American flag-making and a treasure of the Rare Flags collection.